Extend eXtra-Long distances to your equipment closet via Cat-5 cable with RJ45 connectors! Hot Link XL has the same Super Sensitive IR Eye as Hot Link Pro that can be hidden behind your plasma/LCD TV, speaker grill or cabinet door slot. 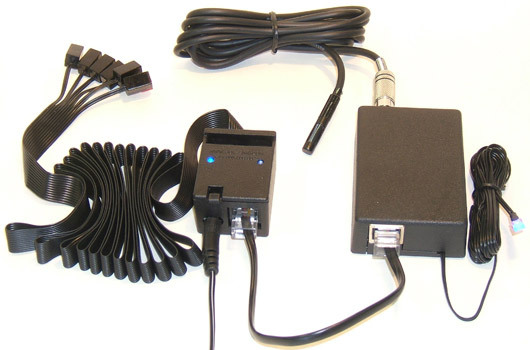 With the Remote Power and Emitter Box, that can now be over 200 feet away from the Eye, Confirmation LED and Main Box using Cat-5 Ethernet cable or phone cable with at least 4 wires. Reverse polarity of these two types of cables is not a problem with the Hot Link XL. It is designed with pin reversal in mind since phone cords are opposite pin to pin and Ethernet/Cat 5 cables are pin for pin. Main Box can be Velcro-mounted to the back of the Flat Panel Display with Eye and Blue Confirmation LED. Install Remote Box with Emitters and DC power entry in remote-located equipment closet. 2 Blue Status LEDs confirm fuse and proper wiring. Six more Emitters can be plugged in to either end of the Cat-5 cable using the Emitter Expansion Kit, for a total of 12 Emitters. Eye Extension cables can be RG6. Get great remote control performance and enhance the beauty of your home theater with Hot Link XL! Click Here to buy Hot Link XL!